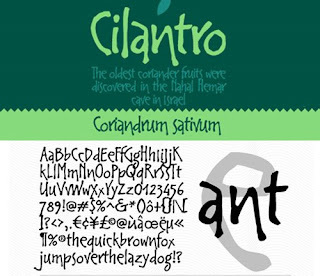 After lots of yummy food inspiration, Cilantro the font was designed for Wilton Foundry in the Summer of 2005. I mean seriously, we all know cilantro makes lots of delicious recipes just that much better! Now I'm getting hungry...what's for lunch...? Okay, back to the font. Cilantro quickly grabbed it's place on the MyFonts Rising Star list that August and has been a favorite with designers and crafters since. It's a fun little font that doesn't take itself too seriously. Whether on a menu, food packaging, in a scrapbook or on an invitation, it's sure to bring that little bit of fun and extra flavor to your design. Enjoy! If you're not a morning person like me, you probably need a smile first thing in the day... well here it is! 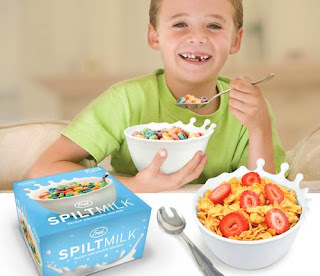 The Spilt Milk Cereal Bowl is a fun, brilliant design that's sure to bring some happiness whenever it's used. It's an instant hit for kids and someone with obvious experience in kiddie bowl flinging thought to make it out of indestructable silicone. Thank you very much. The Spilt Bowl is available mid April and yours truly will be ordering some up for kids and fun adults alike. After all, who doesn't need a little reminder to let loose their inner child now and then? TA DA - leggings pattern preview! Here's a little sneak peek of my new leggings pattern...soon to be listed in my etsy store. Hooray! I've tried and tested the pattern to see if it's as easy to sew and comfy as possible and I think it will be a goody. They're super cozy to wear and I've designed them to have a nice wide, easy to pull up and down waistband. For those of you in potty training mode, you'll love this feature. It's been super helpful with MG. 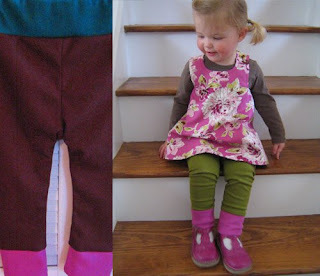 These leggings are also really cute paired with pinafores, dresses and tunics. It's like peanut butter and jelly - they were just meant to be friends. If you're interested, please check out my store. The pattern for sizes 1 to 3 should be listed in the next few days. Enjoy! My dad (and boss) is the master of fonts. No seriously - most men play golf in their free time, my dad designs fonts. Every vacation we went on growing up, half of the photos were us, the other half were signs, packaging, etc for font ideas. I kid you not! Needless to say, I have endless appreciation and respect for what makes a great font and every time I use one in my design work I think a little more about where it may have come from. So I've decided to feature one of his fonts from Wilton Foundry every Friday. For those designers out there, it may show you a little something you haven't seen before and may be needing. For everyone else, it could be an interesting chance to think about using something other than Arial or Times Roman next time you write a letter or send a card. 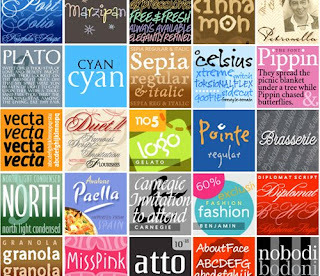 Every font has a story - hope you enjoy them as much as I do! Sock blanks are happiness makers. Seriously, they are! 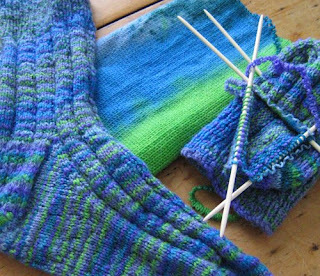 If you've knitted a ton of socks and are looking to spice things up a bit, a sock blank is your friend. My mom gave me one for Christmas (in pink - thanks mom) and it's so much fun to knit up. When you unravel it, it's just knitting with ramen noodles (which can be quite tasty in the right moment). If you'd like to buy one already dyed Fiber Arts Cafe on Etsy has some great ones. I've been drooling on their green colorway one for a while now. 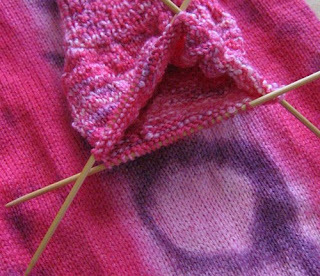 Speaking of drooling, Knit Picks has bare sock blanks that are just begging to be dyed. One of these days I'm going to finally break down and buy a bunch. Oh the possibilities! 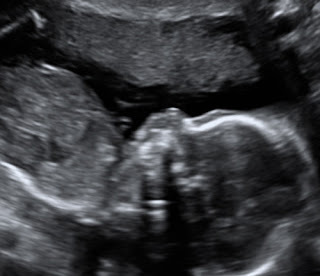 Tim says that if it's a boy we can call him "Dorito" and if it's a girl "Dorita"...I think he's only half kidding. yikes. So for the sake of my baby's name and just for fun, what do you think? Give us your vote, we'd love to hear from you! 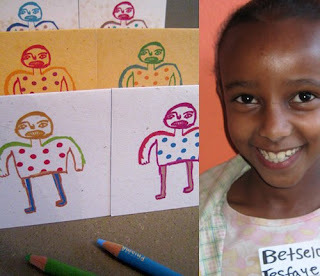 Hanna Teshome runs an orphanage with about 140 children in Addis Ababa, Ethiopia. She is an amazing lady with a deep passion for giving kids hope and love while caring for their physical, emotional and spiritual needs. She takes in homeless children as well as kids who have been illegally imprisoned when their parents are arrested (usually for petty theft of food). They're kept in jail until they're 18 and then many commit suicide due to years of abuse and zero options. 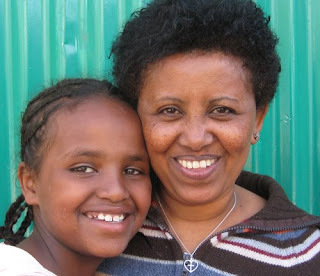 One of my missions is to encourage & enable Hanna (and other Ethiopian women), so that they can continue to create homes for these lost kids in small family settings vs. institutional environments. 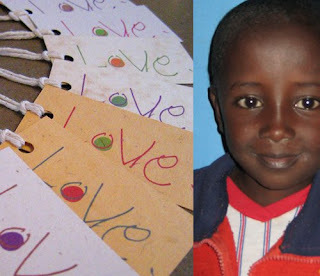 I've set up a separate shop on Etsy just to sell paper goods inspired by the artwork of her kids. I work on the 100% rule - 100% profit to the kids and 100% tree-free mango, banana and coffee papers. If you have a moment, please check it out HERE. These women are my heros and I'm are privileged to know them. 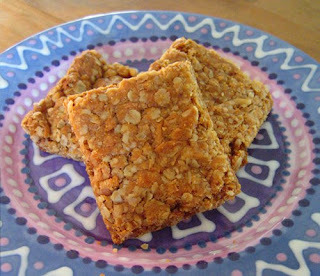 Okay folks, I'm sharing something near and dear to my heart and tummy...my granny's crunchies recipe. They are SO good!! In South Africa everyone grows up on crunchies. They're at most get togethers and could easily be called our equivalent of chocolate chip cookies. Everyone has their own recipe (probably from their mom) and they all have the same basic ingredients...which, I might add, are way healthy and extra delicious! These are great for snacks, play-dates, traveling and even as a "better-for-you" granola bar. Try a batch & enjoy! Mix all of the above ingredients together. In a separate bowl, melt 1 stick of butter and 1 stick of margarine with 1 tablespoon golden syrup (this is a british thing and can often be found in international aisles in the grocery store). Mix well with dry ingredients. Press into a medium baking tray. Bake at 325 degrees for 25 minutes. Cut into squares while warm. Hooray for pinafores! 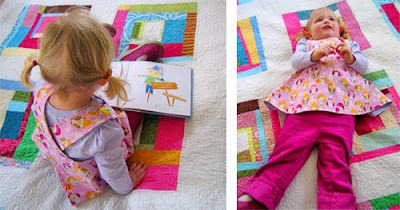 I've been a mini pinafore factory for the past week - nothing could be quicker and more satisfying to sew. MG loves wearing them cause they're perfect for painting and spinning round & round! There are patterns a plenty for buying and for free. I bought mine from "lil peas & carrots" on Etsy. If you have some basic sewing skills and a machine, it's super simple and only needs 2 yards of your fav fabric (one for each reversible side). Extra bonus - the pdf arrives asap (great for impatient crafters like me!). After lots of lurking and way too many images, scraps and ideas crowding my life, I've decided to fire up a blog of my own. I know, talk about coming late to the party! I just figured it's time to have a spot to show n' tell, sketch ideas, share projects and develop goodies for Etsy, Ravelry and work. Maybe it will make me saner, maybe not...either way, here goes nothing!